Design/methodology/approach: This empirical work has been designed with the aim of (1) selecting the best variables from each IC component (human capital-HC, structural capital-SC, and relational capital-RC) at innovative SMEs for explaining cumulative growth; and (2) assessing how much the IC management at innovative SMEs could contribute to their growth. A structural equation model is developed and tested. It allows the identification of the key variables that innovative SMEs are encouraged to manage (17 variables in the current stage) for boosting their growth. Research limitations: The limited sample of 140 SMEs and the regional scope (Galician region) may limit the possibility for directly spreading findings. However, the double test developed (cumulative growth measured in two year and in three year period) and the improved overall goodness fit indexes, both allow pointing out to a future research where final variables can be set. Despite the lack of a unique definition of intellectual capital (IC henceforth), it is usually referred as the intangible- invisible assets or knowledge resources that are able to create value in firms. European Commission (2006) has defined IC as a combination of activities and intangible resources (human, organisational and relational) of an organisation, that enables it to transform a set of material, financial and human resources to a system capable of creating value for stakeholders. Therefore, the IC must be considered as one of more intangibles. In fact, IC can be considered as “[…] the knowledge owned by the organisation (explicit knowledge) or by its members (tacit knowledge) that creates or produces current value for the organisation […]” (Simo & Sallan Leyes, 2008: page 71). In the strategic stream of IC, intangible management in firms have been recognised as key enablers for creating and maintaining sustainable competitive advantages (Li, Pike & Haniffa, 2008). New economy is characterised by the globalisation and the new technologies of information and communication. It is usually highlighted the prevailing soft factors, intangible ones and the human factor of organisations. So, the process of value creation has changed for small and medium enterprises (SMEs henceforth) (Tayles, Pike & Sofian, 2007; Yi & Davey, 2010: page 326). On another hand, innovation is considered as a basic factor for competitiveness in the current international environment. The success and survival of SMEs will depend on an ability to incorporate innovations into their strategies more and more each day (Van Auken, Madrid-Guijarro & García-Pérez-De-Lema, 2008: page 37). This key competitive orientation has been studied using different approaches in the case of SMEs, but a more eclectic approach is perhaps required, such as IC. Key elements for success, as well as the nature and extent of barriers to innovation in SMEs, were also studied. For example, some authors highlight the innovation as the outcome from a knowledge-based process which converts knowledge into business value (Roper et al., 2008). They find that the innovation value chain plays a key role in the innovation success. They find that knowledge is positively related to innovation success in the process of value creation, but there is a lack of information about the elements that most can contribute to this success. The links among innovation activities and growth in innovative SMEs was studied in a descriptive approach for a 3-year period using the average annual rate of growth (Freel & Robson, 2004). The authors report relevant findings regarding positive and negative relationships among different types of innovation (novel and incremental) and several growth measurements. Although they studied the impact of innovation activities on growth, there was no clear identification of other factors that could influence growth, from a more holistic vision of an SME. Concerning the relationships among the environment and innovation processes in SMEs, it was also detected a need for deepening in the links between the so-called institutional support system for innovation (ISI, henceforth) and innovative SMEs (Mancinelli & Mazzanti, 2009). The system of innovation is part of the innovative SMEs environment. Such system should be understood as Freeman (1987) tried to define it: the network of institutions from both the private and public sector, whose activities and interactions start, import, modify and diffuse new technologies. It should be mentioned the relevance of such definition under a systemic focus, as it helps to approach and conceptualise the relationships among systems (mainly, open systems). In such environment, the learning effect and the knowledge value, both are keys for innovating. Efficiency at the innovation process is highly determined by the interactions among the different institutions of the ISI, as several authors claim (Lundvall, 1992, 2010; Caraça, Lundvall & Mendonça, 2009). In this system, the role of both public and private institutions for supporting innovation acquires a high relevance. However, little literature has been found about how much the ISI has an impact on innovative enterprises. In the IC approach, the relationships with the agents of the ISI are considered inside the relational capital (González-Loureiro & Figueroa Dorrego, 2010; González-Loureiro & Pita-Castelo, 2012). Intangibles and, in particular, IC management have become drivers for creating and maintaining sustainable competitive advantages (Sveiby, 2001; Viedma Marti, 2001: page 150; Yi & Davey, 2010: page 328). However, intangibles are underdeveloped in SMEs, as Hutchinson and Quintas (2008) highlighted. Internally, detailed identification of intangible assets and their hidden value is highly significant (Rodríguez-Castellanos, Arregui-Ayastuy & Vallejo-Alonso, 2007: page 132), especially for SMEs, because they need a rapid return on their investments in innovative processes. However, there is not enough research on what the elements are nor on how much they could boost innovation-based growth. In fact, the number of researches on the measurement of IC in recent years is increasingly growing, while researchers try to develop metrics that can also forecast future business results based in the current state of IC indicators (Marr, Gray & Neely, 2003: page 443). IC is sometimes defined “[…] as knowledge that can be converted into value […]” (Edvinsson & Sullivan, 1996: page 358), thus it is quite relevant to prove that IC does create value. However, the nature of research developed is exploratory rather than empirical. They are focused on an epistemological discussion for theoretic model-building instead of testing the empirical validity of the existing theories (Sveiby, 2001; Marr et al., 2003: page 443). Therefore, more empirical research applied to diverse realities is still needed. This lack of research is addressed in this paper from an IC approach, with the aim of identifying the combination of intangible components (human, structural, relational) at innovative SMEs that enables these organisations to transform a set of material, financial and human resources to a system capable of creating value. The paper follows a different approach to previous works, which lack a more structured vision of the enterprise and, more specifically, of SMEs. As stated by McAdam, Moffett, Hazlett and Shevlin (2010), there is a need for further developing models to clarify how, why, and where value is generated through innovation and intangibles management. Thus, authors would like to suggest that an IC approach could provide a more eclectic view of the different elements that could affect the results of the innovation process and, consequently, the growth of SMEs. And both topics, IC and ISI, seem to be very suitable to address the lack of empirical test about IC management at innovative SMEs. This paper introduces one more year in the cumulative growth rate already analysed in a previous research (González-Loureiro & Figueroa Dorrego, 2010), where a period of two years was considered. From there, the maintenance of the main variables, still present in the current model, is pointing out a future model for measuring the SMEs’ IC, where further research is needed yet. The remainder of the paper is organised as follows. Section 2 contains a briefly reflection on the theoretical context about IC and ISI, including links among IC, innovation and growth. Section 3 presents the proposed model, applying the literature premises on IC to the case of innovative SMEs. There, a structural model equation is developed to identify the relationships between IC components and cumulative growth at innovative SMEs. Section 4 describes the empirical work, including the development of a cross-sectional survey and the usual statistical procedures used to evaluate the results. A discussion of the empirical findings as well as limitations is also included in that section. Section 5 presents the main findings and conclusions on the links among IC components that best explain growth in innovative SMEs. Those linkages are expressing cause-effect relationships because IC was measured previously in relation to cumulative growth. -Knowledge systems, which facilitate the identification, acquisition, development, distribution, use and retention of knowledge flow throughout the organisation (Probst & Büchel, 1997; Davenport & Prusak, 1998). The key factor is knowledge as a system. -Knowledge transformation, with a focus on explaining how it can and should be managed for knowledge exchange (Polanyi, 1962; Nonaka & Takeuchi, 1995). The key factor is the knowledge transformation process. -Organisational learning, which emphasises methods for acquiring knowledge through learning within an organisation (Senge, 1992; Argyris, 1993). The key factor is how to convert the inherent knowledge of individuals to knowledge that remains within the organisation. -Capabilities management, which involves the management of human capital comprising skills, attitudes and knowledge (Prahalad & Hamel, 1990; Zack, 1999). The key factor is human capital empowerment. -IC, which involves the measurement, assessment and quantification of intangibles in an organisation because of their ability to create value (Edvinsson & Malone, 1997; Sveiby, 1997). The key factor is measurement of intangibles as an input to facilitate efficient management. Two main approaches are used for the latter: the strategic approach, dealing with classification, creation, management and use of IC; and the measurement approach, which develops metrics and measurement models to determine IC status (Roos, Roos, Dragonetti & Edvinsson, 1997; Tan, Plowman & Hancock, 2008). From a strategic approach, IC and, more specifically knowledge, are used to create and manage intangibles and, thus increase the value of an organisation (Roos et al., 1997). Intangible assets are enablers, as they transform productive resources into value-added assets (Hall, 1992). Therefore, strategic and measurement streams are fully complementary. Comprehensive structures and classifications of models for measuring IC elements have been developed, achieving up to 42 different models (Sveiby, 2010). However, further empirical research is still required to identify the interactive effect of those linkages for assessing how much it contributes to the overall generation of value. There are also a wide range of references regarding the need for appropriate corporate governance indicators linked to knowledge and intangibles in SMEs. Some authors state that business success is based more on strategic management and intangibles as resources, while is less based on physical and financial resources (Bontis, 1998). Choo and Bontis (2002) also claimed that knowledge is the most important strategic resource for a business. Competitive advantage based on knowledge is perhaps the most sustainable in the medium term (Sveiby, 2007). This could indicate that competitive advantages that are sustainable over time should result in superior business performance (Peteraf, 1993) and, thus, growth. However, this must be further empirically tested yet. -Human capital (HC henceforth) can be defined as a set of values, attitudes, qualifications and skills held by employees that generate value for firms (Roos et al., 1997; I.A.D.E-C.I.C., 2003; European Commission, 2006). -Structural capital (SC henceforth) is the worth and value created within the organisation that remains when employees go home. Therefore, it requires a high level of formalisation to avoid dependence on people and to remain within the organisation (Roos et al., 1997; Ordóñez de Pablos, 2004; I.A.D.E-C.I.C., 2003; European Commission, 2006). -Relational capital (RC henceforth) is the result of the value generated by firms in their relations with the environment, including suppliers, buyers, competitors, shareholders, stakeholders, and society. It is the result of an organisation’s ability to interact positively with members of the community to which it belongs to enhance wealth creation through their HC and SC (Viedma Marti, 2001; I.A.D.E-C.I.C., 2003; European Commission, 2006). Organisation capabilities are based on knowledge, tacit knowledge as Marr, Schiuma and Neely (2004) state. Accordingly, the firm´s knowledge must be managed efficiently to achieve better both economic and social performance. Precisely, IC management is the process of extracting value from knowledge (Egbu, 2004). It has been suggested that the greater are the interrelationships among HC, SC and RC, the greater is the value generated. Some authors have identified some links among elements of firms, measured by their IC (Bontis, 1998; Do Rosário Cabrita & Bontis, 2008; Halim, 2010). Bontis (1998) developed a model linking variables of IC and a set of business performance variables. He concluded that causal relationships exist between various elements of IC and explanatory variables for corporate performance. Sales and profit growth were included in the construct in addition to some other static performance indicators, but value added was not. Thus, it can be suggested that IC theories help to identify where the value is generated and what the key elements are for explaining the value creation process. However, little literature has been found concerning cumulative growth thanks to IC on SMEs. On another hand, there is an increasing trend to relate the innovation capacity of an organisation to knowledge management, measured in terms of IC, as reflected in the Oslo Manual (OECD, 2005). For innovative companies, particularly those that are technology intensive, intangible assets often play a critical role in business success (Sánchez et al., 2001). There is a relative consensus that measures of growth must be multi-dimensional in this type of research (Venkatraman & Ramanujam, 1986). So, we suggest that a model which mixes IC with monetary measures is suitable for obtaining further information about where and how much IC affects growth. A great deal of the research on this topic has found that financial measures (return on assets, operating margin, etc.) provide information about the past (Venkatraman & Ramanujam, 1986; Kaplan & Norton, 1992). Conversely, non-financial measures (market share, market value of shares, etc.) provide information about the expectations of stakeholders regarding the future development of the company. The models that include multi-dimensional indicators provide a better understanding of business performance (Kaplan & Norton, 1992). Innovation enables firms to achieve sustainable competitive advantages and this is a key factor for growth (Cheng & Tao, 1999; Van Auken et al., 2008). Higher value added ratios can arise from creativity, which is derived from the intangibles managed by a firm (Bontis, 2001). Thus, several links exist among innovation, IC and growth. Concerning the theories of innovation, an evolution is observed from the linear models to recursive models and, from there, towards the chain-link models. This has opened a new interesting approach to a system where the multiplicity of agents and relationships can be fully developed. It is the multichannel learning model (Caraça, Ferreira & Mendonça, 2006, 2007; Jensen, Johnson, Lorenz & Lundvall, 2007; Caraça et al., 2009), as shown in figure 1. There, the science subsystem is understood as part of the innovation process but it is not always the initial step. Science is only one of the diverse knowledge sources that can induce innovation-based growth (Caraça et al., 2009: page 866). Thus, detecting the agents from the ISI is a key for ensuring the success in the innovation process in the case of SMEs. For the purpose of this paper, interfaces numbered as (1) and (2) in the figure are included inside the RC component. The interface numbered as (3) is inside the SC component. These facts must be remarked as a novel of this research. Several authors emphasise the interactions among the ISI components, as well as between them and components outside that system (Metcalfe, 1995; Lalkaka, 2002; Kayal, 2008). ISI has been usually developed from a geographical approach (mainly national vs. regional), or from a business approach (sectoral vs. technological). Nevertheless, such approaches have not solved the challenge of internationalisation, because agents are multileveled (especially, the public sector) in an international environment (business, scientific system and universities…). The ISI researchers are studying the possible linkages among the business system (where companies do not have to be related commercially), the business networks and the ISI. Those are the main influencing factors on the innovation performance of the whole business system of a region or even in the industrial clusters within a region (Chang & Chen, 2004: page 28). The points discussed above indicate that more detailed research on the links among components of IC and growth in innovative SMEs would be beneficial. The results of such research would help SMEs managers to identify the hidden key components that most influence growth in their innovative activities. The research should also take into account possible simultaneous effects among interrelated components, because changes and improvements in one component (HC, for instance) can affect another (RC, for example), as we introduce in the next section. This section introduces the hypotheses and the model to be tested empirically. In this current stage of development, we have tested it in a sample of Galician innovative SMEs. The measures for each IC component and for growth are justified based on the literature. Chen, Zhu and Xie (2004) have found evidences proving that IC components affect positively to enterprise performance. The higher is the interactions among the three IC components, the greater is the effect on growth. The model introduced here is an evolutionary form of the one presented at González-Loureiro and Figueroa Dorrego (2010). There, the model was tested with a two years cumulative growth rate. Here, growth is measure in a three year period. -(H1) HC proxy variables are directly and positively related to SC proxy variables. -(H2) HC proxy variables are directly and positively related to RC proxy variables. -(H3) SC proxy variables are directly and positively related to the cumulative growth rate of the enterprise (cumulative growth rate of turnover and gross value added in a three year period). -(H4) RC proxy variables are directly and positively related to the cumulative growth rate of the enterprise. -(H5) HC proxy variables are directly and positively related to the cumulative growth rate of the enterprise. -(H6) SC proxy variables are directly and positively related to RC proxy variables. Figure 2 shows a scheme of the proposed relationships. A few authors have researched similar relationships, but there are significant differences. Bontis (1998) tested a model in which IC components were linked to a multidimensional construct of performance indicators, but he includes customer capital instead of RC. Tovstiga and Tulugurova (2009) related some elements of internal and external IC to a construct of performance outcomes and comparative competitiveness. Taking into account the objectives of their model, these authors disaggregated IC into internal factors (HC and SC) and external environmental factors (socio-political, economic and technological factors). They considered RC as one more element within SC. Thus, the model proposed in this paper has notable differences from previous research: in our case, IC has three components (HC, SC, RC) and the cumulative growth rate is the outcome measured. The deployment of advanced statistical techniques, such as a structural equation system, facilitates characterising and quantifying those relationships in a simultaneous way. This technique has been used in similar researches on linkages among IC components and some type of performance indicators, such as the research line opened by Bontis (1998) and followers like Martos, Fernández-Jardón Fernández and Figueroa Dorrego (2008), Fernández-Jardón Fernández and Martos (2009) or Do Rosário Cabrita and Bontis (2008). An equation system like this allows considering diverse levels of dependency with overall measures of goodness fit in a unique model. Therefore, it is required to try keeping the model as simple as possible in terms of parsimony: using the less information to explain the proposed linkages. The model and procedures proposed by the team of prof. Bueno Campos (Bueno Campos, Arrien & Rodríguez, 2003; Bueno Campos, Rodríguez, Murcia & Camacho, 2003) were followed for building the categorisation of components, elements and variables. The latter are highlighted by literature as the “observable” variables. The objective of this procedure is twofold: to reduce the number of variables for measuring each component and explain cumulative growth with an efficient number of variables. This is why only first order constructs are developed (the IC components, i.e. HC, SC and RC). However, the categorisation in components, elements and variables is very useful for the purpose of identifying the key variables. Table 1 to table 3 list the main elements of each IC component. Each element was measured in a questionnaire using a Likert scale from 1 to 5. This scale has been used and validated by several authors in similar research (Zahra & Covin, 1994; Zahra, 1996a; Zahra & Das, 1993; Gallego & Rodríguez, 2005; Fernández-Jardón Fernández & Martos, 2009). HC elements have been measured through 61 variables, SC through 59 variables and RC through 213 variables. It must be mentioned that this was the first stage for developing this model. In this first step, a high number of variables are needed to select the best from each component. Once achieved, the final definition of this model will be addressed in future research. In the case of RC, it is included the relationships with the “ISI agents” and from the public sector as well. This is a multileveled system: agents from European Union, from Spain and from the Region of Galicia have been included. This explains the high number of variables in this component. Table 4 lists the two dimensions of growth as the response variable in the model. Information about growth in turnover and value added was obtained from official accounts filed by SMEs in the Commercial Register. SABI database was used to obtain such indicators for each SME. For innovative companies, the effect of innovations on performance is affected by a time lag between development of an innovation and results derived from it. This period is not clearly fixed and differs from the time when an innovation is developed and an economic outcome is obtained (Zahra & Das, 1993; Zahra, 1996b; Zahra & Bogner, 1999; Kanter, 2000). The most usual practice for measuring innovation outcomes is to consider a period of 3 or 5 years (OECD, 1992), from the moment when applied research is carried out until an incremental innovation outcome is achieved. Thus, in this step, a period of 3 years is used to test our model. This must be highlighted because it is a critical methodological issue due to the lack of updated accounting information. Future research using this model might consider a longer period of time up to 5 or more years. Nevertheless, findings could be arguable if such a longer period is considered, due to the effect of changes in the meantime that could invalidate the cause-effect link. Thus, perhaps a three year is the optimal option for measuring the medium-term effect. In this case, cumulative growth is calculated in the period from 2003 to 2006. For instance, process innovations can improve performance measures in a short time, helping managers to streamline operations and increase efficiency, productivity and cost savings. Conversely, product innovations may reduce profitability in the short term because of the investment required to develop and position these products in the market (Zahra, 1996b). Therefore, time should be taken into account for this type of measure, to avoid the possible effects of random fluctuations and anomalies in the annual data (Youndt, Subramaniam & Snell, 2004: page 347). Sales growth reflects the market acceptance of a company’s products and thus is an indicator of success in its expansion through innovation (Zahra & Das, 1993: page 25; Zahra & Bogner, 1999: page 156). Value added or value aggregate (VA) is an indicator of compliance with financial objectives (Chen et al., 2004). In economic terms, VA is an accurate indicator of a company’s ability to generate additional value for some external inputs (Edvinsson & Malone, 1997; Marr et al., 2003). VA can be also used for measuring the performance of the global activities of an enterprise (Bontis, 2001). It is commonly defined as the difference between offered products and the cost of goods and services transferred from other external companies. The value added by an organisation is one of the most important indicators at present, taking into account the general socioeconomic crisis since 2008 on. In the IC discourse, the value of a company (market value) is considered as a combination of tangible accounting value coming mainly from traditional forms of capital, such as physical and monetary capital and intangible value, the IC that comes from HC, SC and RC. This section describes the methodology for sampling, data collection, their analysis, and the procedures for testing the proposed model in a sample of SMEs in Galicia (a region of Spain). Economic and financial information was taken directly from the SABI database, which contains comprehensive official information on companies in Spain. Statistical information about IC corresponds to a representative sample of 140 SMEs in Galicia (see Table 5) that were considered as innovative firms in 2003. Full information was available on their turnover and value added from 2003 to 2006 in the official Commercial Register (accessible through the SABI database). Table 6 lists the breakdown of the number of SMEs by sectors. Economic and financial information for the period 2003-2006 was obtained after the survey was completed in 2003. Therefore, the results represent the medium-term impact of IC on growth. Figure 3 shows the procedure followed for data analysis and model testing. An initial exploratory factor analysis was carried out to select the best variables in each construct. In the second step, data reduction was performed using squared multiple correlations and standardised factor loadings, obtaining the final set of variables for testing the model. The software used was SPSS (v.15) in the first step, which was combined with AMOS for Windows (v. 7.0) in the second step. The reliability of the constructs is tested according to usual procedures (see table 7), using Cronbach’s alpha and variance extracted from a confirmatory factor analysis (factor and standardised loadings, as well as multiple correlations are used). After the dimensions were tested by factor analysis, causal diagrams are plotted to test the causal relationships among the elements within the three IC components and cumulative growth rates simultaneously. Structural equation modelling requires a variance-covariance matrix (Lévy Mangin, 2003: pages 789–790), so it would be necessary to interpret data in terms of measurement units. To avoid this, the output was generated using standardised solutions. It was also necessary to test the multivariate normality of the data by calculating the index of kurtosis in order to determine the estimation method to be used. The test revealed that the sample was not normally distributed (kurtosis=239.568, c.r.= 25.062), so the maximum likelihood technique using bootstrapping with 200 iterations was chosen to control the non-normality of the data. Three assessment measures were used (Mulaik, James & Van Alstine, Bennet, Lind, & Stilwell, 1989; Bollen & Long, 1993): absolute fit, parsimony and incremental fit. The results are listed in table 8. A final set of 17 variables are identified. They are the best explaining variables of the cumulative growth rates in innovative SMEs in Galicia (see table 9). It has not been possible to better align the global model with the available data. An initial limitation of the model is that no control variables have been included, such as the business sector, company size or type of innovation (process, product, etc.). Control variables should be included in future research, as they might lead to differences. However, in this type of structural equation, the difficulties arise from the compromise between the number of variables used (parsimony forces to use the fewest variables as possible) and the maximum amount of information in the model. The approach used here is to optimise the response construct (growth in this case) using a more efficient number of dimensions for each explanatory construct (HC, RC, SC in this case). Few changes can be observed when comparing those variables with the two year cumulative growth model reported in González-Loureiro and Figueroa Dorrego (2010). Anyway, it can be reported a general improvement of the goodness of fit indexes, which is caused by the inclusion of one more year. Level of training in new technologies by employees at human resource Dept. Level of training in new technologies by employees at administration and finance Dept. (*) Level of training in new technologies by employees at Logistics and Purchasing Dept. (*) Level of training in new technologies by employees at Marketing and Commercial Dept. In the case of HC two new variables are introduced by the method. They are related with the level of training in new technologies by employees in the Logistics and Marketing departments. In the case of SC, the method introduces two new variables while one is rejected when compared to the two year model. The latter is related with the capability of the SMEs to adapt quickly to the changing environment. It seems that in the medium-term this variable loses relevance compared with a shorter term. The two new variables deal with teamwork and sharing success and failures, i.e. organisational learning and culture. In the case of RC, the changes are related to the degree of usefulness of relationships with Universities and with Public Research Centres. It is worthy to highlight that changes in this component have less significance, because they are merely related to simple replacements in variables within the same element (ISI agents) and even related to the same agent (changing the measure from “satisfaction” to “usefulness”). Therefore, the key variables are essentially the same. Finally, concerning the six hypotheses contrasted, the overall indexes of goodness as well as the low values that some of them showhave lead us to accept the H1, H2, H3 and H4 linkages, plotted in the path diagram (Figure 4). There are not enough statistical arguments to support the existence of a linkage between SC and RC to explain cumulative growth in this sample (H6). Nor can be validated the existence of a direct linkage from HC to cumulative growth (H5). Figure 4 shows the final model specification, with the dimensions of the constructs (HC, SC, RC) and the relationships among them depicted graphically. The problem addressed in this research is the lack of models relating IC components to growth in innovative SMEs. One of the main conclusions is that there are some relevant linkages among some (but not all) the components of IC to explain cumulative growth rates in those firms. Other relevant information was also obtained from each of the constructs, particularly for the aim of IC management in innovative SMEs. The results seem to highlight that HC is the basic starting point in innovative SMEs: the main link that explains growth in these enterprises is HC-SC. An unexpected conclusion is the low degree of linkage between HC and RC for explaining growth. One might expect that the institutional agents for supporting innovation would play a greater role in the case of innovative SMEs, particularly, because SMEs usually have several constraints on resources and capabilities for innovation. Thus, an important finding is that innovative SMEs appear to have a low degree of dependence on the ISI, such as universities and technological centres. Or at least, it could be suggested that the ISI was not having a high degree of positive impact in the period analysed. The results seem to point out that internal factors play a predominant role in the innovation processes in SMEs, whereas RC (external links) would play a secondary role. The capability of innovative SMEs to transform HC into SC is another relevant finding. These findings have relevant managerial implications: successful growth in innovative SMEs seems to be highly dependent on the process for transforming the knowledge of employees into organisational knowledge, i.e. the key is the organisational learning capability. This finding seems to be more important if we deepen in its background: the link between HC and SC could suggest that employees can make no contribution unless the firm plays a role with its shared values and organisational structure. This finding emphasises the essential role of the entrepreneur and the organisation itself. On the other hand, the results might also suggest that RC component should not be considered separately from the other IC components, but as a complementary support for the HC and SC management: RC provides an extra growth rate, even though its contribution is still low in this sample. Some conclusions could be suggested for the proxy variables for each element of IC in terms of their influence on cumulative growth rates in innovative SMEs. For instance, in the HC construct, proxy variables are related to efficiency and training in the use of new technologies, especially for administration and finance staff. These items seems to point out the importance of the administration and finance staff in innovation processes as they are related to efficient value creation. Furthermore, the new technologies seem to play a key role as facilitators in the process of transformation of HC into SC. In the SC construct, proxy variables are related to the way in which knowledge, skills, values and attitudes are shared. i.e. the cultural system of the organisation. This element might be underlining the degree in which organisational system (thus, the enterprise) could help to improve the tasks carried out by workers. In the RC construct, proxy variables are a mix of public support for innovation, information sources and services for supporting innovation. It should be noted that RC is the IC component that has the greatest number of variables to explain growth, but the HC–RC link has the lowest explanatory power of growing. These variables seem to point out that the ISI is the most important element for boosting growth in this sample of SMEs. It should bear in mind that only those agents seem to positive influence growth. Conversely, variables measuring relationships with other agents (customers, allies and so) do not seem to have significance for explaining growth in the medium term. Some new challenges should be addressed in future research from the SME perspective. The ISI should take into account the needs of SMEs. This research reveals that such institutions are not still playing a key role in the innovative SMEs’ growth (in the period analysed). This finding has relevant implications from the perspective of both SMEs needs and public policies. In contrast to previous results for systems of innovation (Freeman, 1987; Lundvall, 1992; Nelson, 2002; Fritsch & Franke, 2004; Fritsch & Slavtchev, 2008), it seems that these institutions have not yet been able to incorporate the needs of SMEs. This issue should be addressed in the near future if public sector wants to boost innovation as a key factor of an economy for growing. From the findings in this paper, the contribution of innovative SMEs to innovation theory could be further developed from the micro-level up to the meso- and macro-levels, as reported in Dabic, Cvijanović and González-Loureiro (2010): the effect of innovations on a sector and on a region (where the linkages could be double-way). Some other examples for future research from the perspective of the impact on SMEs arise from this paper. We should mention the challenges that university faces concerning their role in the system of innovation. It is expected that in the new paradigm of more entrepreneurial universities, they seek more industry-university collaborations. In such case, the development of new applications of IC management tools to universities might help to reduce some of the fairly possible existing barriers, especially in what concerns to the RC component of universities (i.e. creating value while relating). We can also make a call for research from the IC approach on the new paradigm of the open innovation. If knowledge spillovers are the key expected income for improving the innovativeness of the business system, then more empirical research is required to find out the way in which universities may take advantage of such spillovers while avoiding being an additional cost for SMEs. In reviewing the critiques of the resource-based theory-RVB, Kraaijenbrink, Spender and Groen (2011) state that the transaction cost theory is usually useful to explain how to manage scarce resources in predictable environments. On the other hand, those authors claim that there is not scarcity of knowledge. Hence, the RVB is not adequate for dealing with it. Nevertheless, as our research shows, what actually seems to be scarce is the knowledge that SMEs’ managers have for managing such firms in the unpredictable environments we live. That means that we need new theoretical and empirical research in order to probe whether the IC approach is fruitful for managing non-rivalrous and non-scarce resources, those that can make a difference in competing today. ARGYRIS, C. (1993). Knowledge for action: A guide to overcoming barriers to organizational change. San Francisco: Jossey-Bass Inc.
ASHEIM, B.T. ; COENEN, L.; SVENSSON-HENNING, M. (2003). Nordic SMEs and Regional Innovation Systems. Final Report, Nordic Industrial Fund. BOLLEN, K.A. ; LONG, J.S. (1993). Testing structural equation models. Newbury Park: Sage Publications. BONTIS, N. (1996). There's a price on your head: Managing intellectual capital strategically. Business Quarterly, 60(4): 40-78. BONTIS, N.; DRAGONETTI, N.C.; JACOBSON, K.; ROOS, G. (1999). The knowledge toolbox: A review of the tools available to measure and manage intangible resources. European Management Journal, 17(4): 391-402. http://dx.doi.org/10.1016/S0263-2373(99)00019-5. BROOKING, A. (1996). Intellectual capital: Core assets for the third millennium enterprise. London: International Thomson Business Press. BUENO CAMPOS, E.; ARRIEN, M.; RODRÍGUEZ, O. (2003). Modelo intellectus. Medición y gestión del capital intelectual. IADE-CIC 5, Documentos Intellectus: 1-172. BUENO CAMPOS, E.; RODRÍGUEZ, Ó.; MURCIA, C., CAMACHO, C. (2003). Metodología para la elaboración de indicadores de capital intelectual. IADE-CIC 4, Documentos Intellectus. BUESA, M.; CASADO, M.; HEIJS, J. (2002). El Sistema regional de innovación de la Comunidad de Madrid, available on: http://www.madrimasd.org/informacionidi/biblioteca/publicacion/doc/Sistema_regional.pdf. Consejería de Educación de la Comunidad de Madrid. BUESA, M.; HEIJS, J.; MARTÍNEZ PELLITERO, M. (2002). Una tipología de los sistemas regionales de innovación en España. Revista madri+d monografía nº 5(diciembre). CAÑIBANO CALVO, L.; SÁNCHEZ, M.P. ; GARCÍA-AYUSO COVARSI, M.; CHAMINADE DOMÍNGUEZ, C. (2002). Directrices Para la gestión y difusión de información sobre intangibles. Informe sobre el capital intelectual. Madrid: Meritum Proyect. CARAÇA J.; FERREIRA, J.; MENDONÇA, S. (2006). Modelo De interacções em cadeia: Um modelo de inovação para a economia do conhecimento, Mimeo. Porto: COTEC — Portuguese Industry Association for Innovation. CARAÇA, J.; FERREIRA, J.L. ; MENDONÇA, S. (2007). A chain-interactive model of the innovation process: An introduction. Dept. of Economics, ISEG — Technical University of Lisboa, W. P.
CARAÇA, J.; LUNDVALL, B.; MENDONÇA, S. (2009). The changing role of science in the innovation process: From queen to Cinderella? Technological Forecasting and Social Change, 76(6): 861-867. http://dx.doi.org/10.1016/j.techfore.2008.08.003. CHANG, Y.; CHEN, M. (2004). Comparing approaches to systems of innovation: The knowledge perspective. Technology in Society, 26(1): 17-37. http://dx.doi.org/10.1016/j.techsoc.2003.10.002. CHOO, C.W. ; BONTIS, N. (2002). The strategic management of intellectual capital and organizational knowledge. Oxford: Oxford University Press. DAVENPORT, T.H. ; PRUSAK, L. (1998). Working knowledge: How organizations manage what they know. Boston: Harvard Business School. DENISON, D.R. (1990). Corporate culture and organizational effectiveness. New York: Wiley. EDVINSSON, L.; MALONE, M.S. (1997). Intellectual capital: Realizing your company's true value by finding its hidden brainpower. New York: HarperBusiness. EDVINSSON, L.; SULLIVAN, P. (1996). Developing a model for managing intellectual capital. European Management Journal, 14(4): 356-364. http://dx.doi.org/10.1016/0263-2373(96)00022-9. EGBU, C.O. (2004). Managing knowledge and intellectual capital for improved organizational innovations in the construction industry: An examination of critical success factors. Engineering, Construction and Architectural Management, 11(5): 301-315. EUROPEAN COMMISSION (2006). Reporting Intellectual capital to augment research, development and innovation in SMEs. Report to the commission of the high level expert group on RICARDIS. Encourage corporate measuring and reporting on research and other forms of intellectual capital. Europe: European Commission. FREEMAN, C. (1987). Technology policy and economic performance: Lessons from Japan. London: Pinter Publishers. FRITSCH, M.; FRANKE, G. (2004). Innovation, Regional knowledge spillovers and R&D cooperation. Research Policy, 33(2): 245-255. http://dx.doi.org/10.1016/S0048-7333(03)00123-9. FRITSCH, M.; SLAVTCHEV, V. (2007). What determines the efficiency of regional innovation systems? Jena Economic Research Papers, 1: 1-38. FRITSCH, M.; SLAVTCHEV, V. (2008). Determinants of the Efficiency of regional innovation systems. First Regional Studies (First published on: 06 October 2008). GARCÍA-MERINO, J.D. ; ARREGUI-AYASTUY, G.; RODRÍGUEZ-CASTELLANOS, A.; VALLEJO-ALONSO, B. (2010). Motives for the financial valuation of intangibles: reasons and results. In B. Vallejo-Alonso, A. Rodríguez-Castellanos & G. Arregui-Ayastuy (Eds. ), Identifying, measuring, and valuing knowledge-based intangible assets: New perspectives, 309-335. Hershey, PA: Business science Reference. IGI Global. I.A.D.E-C.I.C. (2003). Modelo intellectus: Medición y gestión del capital intelectual. Madrid: Centro de Investigación sobre la Sociedad del Conocimiento. KANTER, R.M. (2000). When a thousand flowers bloom: Structural, collective, and social conditions for innovation in organizations. In R. Swedberg (Ed. ), Entrepreneurship: the social science view. Oxford: Oxford University Press, USA, 167-210. KAPLAN, R.S. ; NORTON, D.P. (1992). The balanced scorecard--Measures that drive performance. Harvard Business Review, 70(1): 71-79. LALKAKA, R. (2002). National innovation systems: Role of research organizations and enterprises. Proceedings of the IV International Symposium on Environmental Biotechnology, Veracruz, Mexico, June 2002. LÉVY MANGIN, J.P. (2003). Modelización y análisis con ecuaciones estructurales. In J. Varela Mallou, J.P. Jévy Mangin & J. Abad González (Eds. ), Análisis multivariable para las ciencias sociales. Madrid: Pearson Educación, 767-814. LUNDVALL, B. (1992). National systems of innovation. Towards a theory of innovation and interactive learning. London: Pinter Publishers. LUNDVALL, B. (2010). National systems of innovation: Toward a theory of innovation and interactive learning. London: Anthem Publisher. MERTINS, K.; WILL, M.; PUBLICA, F. (2007). A consistent assessment of intellectual capital in SMEs InCaS: Intellectual capital statement–made in Europe. The Electronic Journal of Knowledge Management, 5(4): 427-436. METCALFE, J.S. (1995). Technology systems and technology policy in an evolutionary framework. Cambridge Journal of Economics, 19(1): 25-46. MORCILLO, P.; ALCAHUD LÓPEZ, M.C. (2005). Creatividad que estás en los cielos...., available on: www.madrimasd.org/revista. Revista madri+d monografía nº 30. NASH, H. (1998) Accounting for the future, a disciplined approach to value-added accounting, available on: http://home.sprintmail.com/humphreynash/indexback.htm. NELSON, R.R. (1993). National innovation systems: A comparative analysis. USA: Oxford University Press. NELSON, R.R. (2002). Technology, institutions, and innovation systems. Research Policy, 31(2): 265-272. http://dx.doi.org/10.1016/S0048-7333(01)00140-8. NONAKA, I.; TAKEUCHI, H. (1995). The knowledge-creating company: How Japanese companies create the dynamics of innovation. New York, Oxford University Press. OECD (1992). Technology and the economy: The key relationships. Europe: OCDE. OECD (1997). National innovation systems. Paris: OCDE Publications. OECD (1999). Managing national innovation systems. Paris: OCDE Publications. OECD (2005). Oslo manual. Guidelines for collecting and interpreting innovation data. Europe: OCDE. PRAHALAD, C.K. ; HAMEL, G. (1990). The core competence of the corporation. Springer. PROBST, G.; BÜCHEL, B.S.T. (1997). Organizational learning: The competitive advantage of the future. Prentice Hall Upper Saddle River, NJ. PULIC, A. (2004). Do we know if we create or destroy value? International Journal of Entrepreneurship and Innovation Management, 4(4): 349-359. RODRÍGUEZ-CASTELLANOS, A.; ARREGUI-AYASTUY, G; VALLEJO-ALONSO, B. (2007). Intangibles financial valuation: A method grounded on an IC-based taxonomy. In Joia LA (Eds.) Strategies for information technology and intellectual capital: Challenges and opportunities. Idea Group Publishing, 66-90. ROOS, J; EDVINSSON, L. (2001). Capital intelectual: El valor intangible de la empresa. Barcelona Paidós. ROOS, J.; ROOS, G.; DRAGONETTI, N.C; EDVINSSON, L. (1997). Intellectual capital: Navigating the new business landscape. Basingstoke MacMillan Business. ROUSE, M.J.; DAELLENBACH, U.S. (1999). Rethinking research methods for the resource-based perspective: Isolating sources of sustainable competitive advantage. Strategic Management Journal, 20(5): 487-494. http://dx.doi.org/10.1002/(SICI)1097-0266(199905)20:5<487::AID-SMJ26>3.0.CO;2-K.
SÁNCHEZ, M.P. ; CAÑIBANO, CALVO L.; ASPLUND R.; STOLOWY, H.; ROBERTS, H.; JOHANSON, U.; MOURITSEN, J. (2001). Measuring intangibles to understand and improve innovation management (MERITUM). Final report, European community under targeted socio-economic research (TSER). SANTOS RODRIGUES, H. (2008). Modelo de análisis del capital intelectual bajo la perspectiva de la incidencia en la capacidad de innovación: Aplicación al sector de automoción de la Euroregión Galicia Norte de Portugal. Universidad de Vigo. SANTOS RODRIGUES, H.; FIGUEROA DORREGO, P. (2010). The relation between network of collaboration (as a relational capital dimension) and firm innovativeness. Proceedings of the 2nd European Conference on Intellectual Capital, Lisboa, Portugal, 29-30 March 2010. pp.521-522. SANTOS RODRIGUES, H.; FIGUEROA DORREGO, P.; FERNÁNDEZ-JARDÓN FERNÁNDEZ, C.M. (2007). Knowledge and innovativeness. The International Journal of Knowledge, Culture and Change Management, 7(8): 87-92. SENGE, P.M. (1992). La quinta disciplina: Cómo impulsar el aprendizaje en la organización inteligente. Barcelona: Granica. SHIU, H.J. (2006). Application of the VAIC method to measures of corporate performance: A quantile regression approach. Journal of American Academy of Business, 8(2): 156-160. SIMO, P.; SALLÁN LEYES, J.M. (2008). Capital intangible y capital intelectual: Revisión, definiciones y líneas de investigación. Estudios De Economía Aplicada, 26(2): 65-78. STEWART, T.A. (1997). La nueva riqueza de las organizaciones: El capital intelectual. Buenos Aires Granica, cop. 1997: Granica. SVEIBY, K.E. (1997). New organizational wealth: Managing & measuring kwowledge-based assets. San Francisco Berret-Koehler Publishers, cop. 1997: Berret-Koehler Publishers. SVEIBY, K.E. 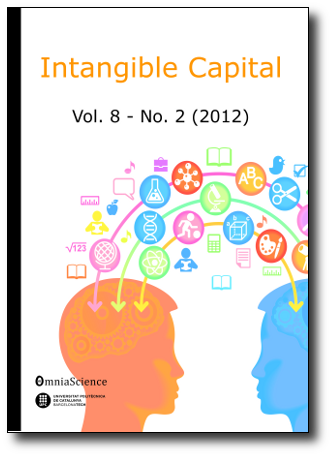 (2010) Methods for measuring intangible assets, available on: http://www.sveiby.com/articles/IntangibleMethods.htm. UMEMOTO, K. (2002). Managing existing knowledges not enough: Knowledge management theory and practice in Japan. In C.W. Choo CW & N. Bontis (Eds. ), The Strategic management of intellectual capital and organizational knowledge. Oxford: Oxford University Press, 463-476. VENKATRAMAN, N.; RAMANUJAM, V. (1986). Measurement of business performance in strategy research: A comparison of approaches. Academy of Management Review, 11(4): 801-814. ZACK, M.H. (1999). Developing a knowledge strategy. California Management Review, 41(3): 125-145.